Computed Tomography (CT) Scan is a medical imaging procedure that uses x-rays to obtain cross sectional images of the body. 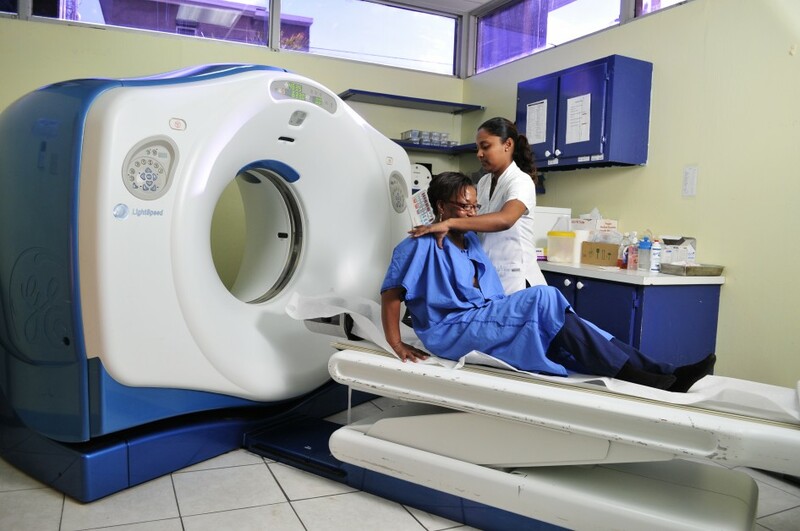 CT is used to investigate a wide variety of medical conditions in the brain, spine, chest, abdomen, pelvis and extremities. Some studies require the intravenous (into a vein) injection of an Iodine containing liquid (contrast medium), in order to better visualize certain structures. These examinations require a referral from your physician stating the clinical history. Iodinated contrast can only be given to those with normal kidney function. If you are over age 50, we may request a blood test (creatinine) to make sure your kidney function is normal. The Radiographers carry out this procedure to provide cross-sectional images of the chest. Diseases of the lung, heart, blood vessels can be diagnosed by CT, often using intravenous contrast medium. is used to highlight the blood vessels in the lungs to show abnormalities. CT scans of the spine provides detailed images of the bones in the spinal column. They are useful in evaluating trauma, cancer and degenerative conditions. However, for evaluation of the spinal cord and the intervertebral discs, an MRI examination is usually preferable.